Other Food: daily devos: My projects or His purposes? "St. John the Baptist Sees Jesus From Afar"
John's career choice as a baptizer was not some random job that came out of a brainstorming session with his high school counselor. It was a God-inspired career the main purpose of which was to introduce Messiah. It was the curtain rising, the drum roll on Jesus, the Lamb of God. 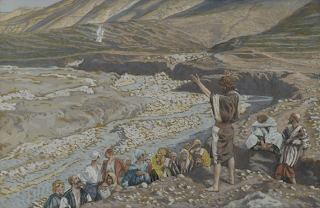 "I did not know Him but that He should be revealed to Israel, therefore I came baptizing with water....I did not know Him but He who sent me to baptize with water said to me, 'Upon whom you see the Spirit descending and remaining on Him, this is He who baptizes with the Holy Spirit' and I have seen and testified that this is the Son of God!" John 1:31, 33-34. John, the writer of this gospel, doesn't describe that baptism but Matthew does. In fact, it seems John the Baptist had no clue who the person would be. For when Jesus asked John to baptize Him John "...tried to prevent Him saying, 'I need to be baptized by You and are You coming to me?'" How exciting it must have been for John to see what God had told him secretly happening before his eyes and everyone watching. How fulfilling to know that he was God's instrument and his life was furthering God's eternal purposes. Isn't that what we as Christians all want — to know that our actions, words, and lives have accomplished something significant and lasting because they were God-centered and aligned with what God was doing? "To live a God-centered life you must focus your life on God's purposes, not your own plans. You must seek to view situations from God's perspective rather than your own distorted human outlook. How do I rate here? How do you? Are we dreaming up projects and asking God to bless them? Or are we waiting for God's explicit instructions or joining Him in His work already in progress? PRAYER: Dear God, help me to be God-centered with my life focused on fitting in with Your purposes and exalting Jesus. In today's reading we read that a man named Andrew was in the crowd. He was so impressed with what he saw, and with Jesus, that he ran to find his brother Peter, greeting him with the words: "We have found the Messiah." Then he brought Peter to Jesus and so began some eternal relationships.